Chris Richardson was born to a father with a car habit and a grandfather with a train habit. It all started when Louis Richardson made his 6 year old son the official nut and bolt sorter as he worked on one of his many car projects. Chris moved up to flashlight holder, parts cleaner and eventually earned full rights to the garage. Years later, Chris began helping his grandfather, Alfred Tedesco, with his projects. Alfred was a fabricator with Southern Pacific Railroad for 42 years and he taught his grandson how to weld and fabricate metal with a master craftsman’s precision. Looking back, Chris credits both father and grandfather for giving him a love of building things, an obsession for detail and a respect for the meaning of hard work. First projects: Schwinns, go-karts, mini bikes with friends in the Richardson Family garage. First car project: a 1961 Chevy Bel Air hardtop at age 15. First street bike build: a 1966 Harley Davidson shovelhead. Nothing was as exciting as building and riding that first shovel. So after a few union construction jobs, getting married to Fiona and having two…daughters – Chris turned his hobby into his own business – LA Speed Shop. The Specialty: vintage choppers and bobbers with a bare bones style. 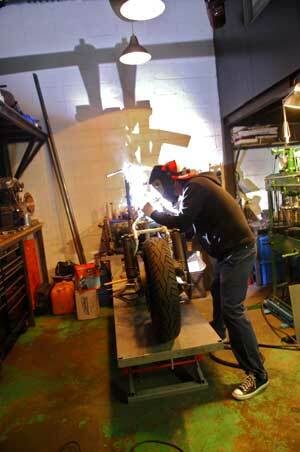 Every bike Chris builds reflects his out of the box thinking and amazing attention to detail. Chris has earned the respect of his customers and peers as a quality guy who does quality work. 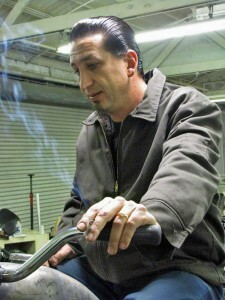 Having his bikes featured on the covers Easyriders, Iron Horse, Dice and Powerglide, and after earning countless awards at motorcycle shows, he is also recognized as a leading innovative builder in the industry. Today you can mostly find Chris at his shop in Los Angeles working on bikes and designing parts. It’s all about being creative and putting a little twist on how you can do the same thing but just a little better every time. If you hang out , you’re likely to see his dad wander in to discuss one of his cars. After all, it’s still a family garage. Chris Richardson is LA Speed Shop.